We feel that our excellent customer service and quality workmanship set us apart from others in our industry, and we take pride in our work. At Capital Roofing, Inc., we develop long-term, satisfying relationships with our clients, many of whom have been with us the entire time we’ve been in business. We take customer service seriously, because we see roofing as primarily a service industry. Because we are a small business, we are accountable to you on a personal and professional basis. We value integrity and honesty above all else, and our name and reputation are at stake when we service your account. Our staff has a great depth of knowledge in all aspects of roofing and sheet metal work repairs. No one in our field management team has less than 10 years roofing experience. 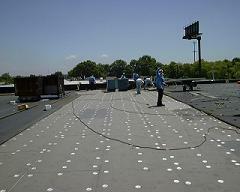 We are licensed by all major roofing manufacturers and are a member of a number of professional organizations. Don’t just take it from us! Call one of our satisfied customers. Please contact us for a list of references in your area. We hope you will consider us for all your roofing needs. We truly are here to serve you with our knowledge and our quality of workmanship, but most especially with our sincere desire to live up to our reputation of dependability and excellent customer service. We look forward to hearing from you; please use our online contact form or call us at 301-322-2400. Emergency Service 24 hours a day, 7 days a week. We have lights for night work! Free Estimates before we send out a work crew, so that you have more information about the condition of your roof and we may do an accurate and complete inspection. Total Job Completion including fabrication and installation of sheet metal from our shop in Landover, MD. Competitive Rates on time and materials and estimated work, with negotiated amounts for preventive maintenance contracts or large jobs. 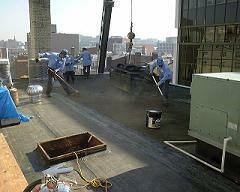 Responsible Workers hired for their courtesy and communication in addition to roofing skills. We perform regular drug testing, as well as regular safety and training meetings.